The golf bag was delivered today - it's really beautiful!!!! I also would like to thank you for the included gift (golf towel) which I much appreciate. 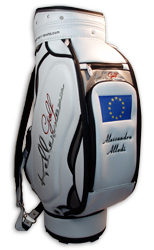 It has been a pleasure being your customer and should I need a new bag I will certainly get back to you.